Costa Rica may only be approximately the size of West Virginia, but it packs an ecologically diverse punch. Over the course of this twelve-day teen hiking trip adventure, you’ll see beautiful beaches, lush rain forests, impressive mountain peaks, and abundant wildlife. 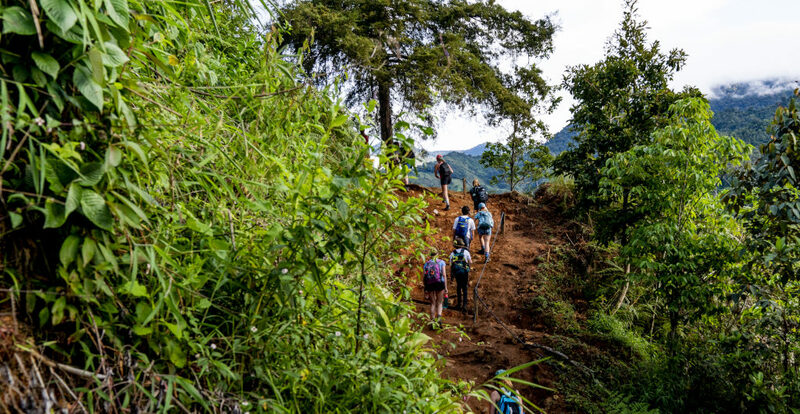 You’ll hike in a wildlife-rich national park with local guides, spend time exploring and volunteering at a eco-lodge in the heart of the rain forest, explore the trails around Costa Rica’s tallest peak, and surf and snorkel in the Pacific Ocean with professional guides. You’ll return home with a wealth of new friendships, endless stories, and memories to last a lifetime. We’ll meet at the San Jose airport and head straight to the Pacific coast to explore Manuel Antonio National Park. We’ll take a guided tour of the Park with rangers, get to know the resident sloths, enjoy the antics of the three different species of monkeys, and swim in warm, clear, Pacific water. 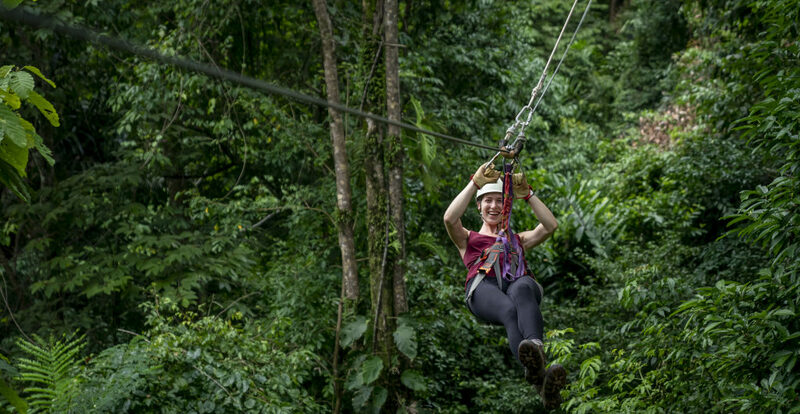 To cap off our time in this beautiful area, we’ll take a canopy tour on Costa Rica’s longest zip line, soaking in views of the Cloud Forest. Our next stop is the mountain village of San Gerardo, nestled at the base of Cerro Chirripó, Costa Rica’s tallest mountain. During our three days here, we’ll explore the wide variety of trails with gorgeous mountain vistas, waterfalls, and wildlife in the beautiful protected areas around Chirripó. After exploring all that Chirripó National Park has to offer, we’ll backpack into the wilderness to a scenically located eco-lodge in Costa Rica’s Savegre River valley. Here, we’ll work on a community service project with the owners of the eco-lodge (who are working to reforest the area), take a lesson in cooking (and eating!) traditional Costa Rican food, and set out on a guided night-hike to see some of the incredible bio-diversity that comes out at night in Costa Rica’s rainforest. Off with the hiking boots and on with the flippers! The next page of our adventure takes us to the Pacific beach town of Uvita, with their famous “whale’s tail” breakwater. 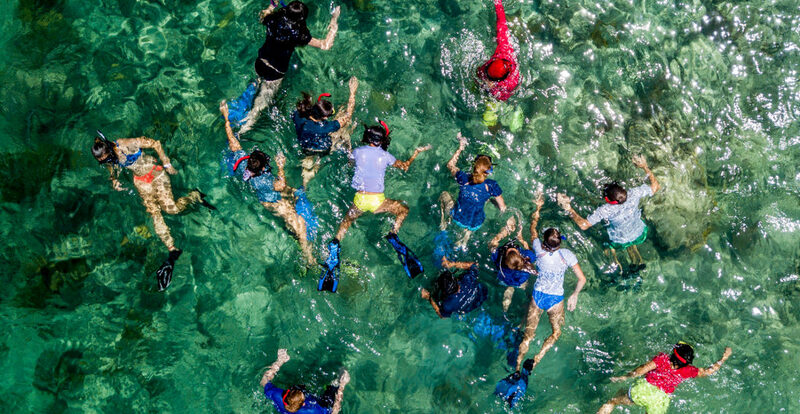 What better way to celebrate our hiking accomplishments than by surfing and snorkeling? With our professional guides, we’ll cruise out to Caño Island where we’ll snorkel some of the most biologically diverse waters in Central America. The next day, we’ll “hang ten” as we learn how to surf on the beautiful beaches of Playa Uvita. A festive farewell dinner in the capital city of San Jose with our new friends will cap off our Costa Rica Mountains & Coast adventure. How physically challenging is CRMC? Given a Challenge Level of 4 (out of a maximum of 10), we consider Costa Rica Mountains & Coast to be an intermediate hiking trip that any moderately fit, motivated student can successfully complete with some preparation. Compared to similar hiking trips, we believe that CRMC is slightly more challenging than our Maine’s Downeast Explorer trip (mostly due to trip length and the challenge of summiting Chirripó), but just a bit easier than our Northwest Explorer trip. Please note that all of Apogee’s Challenge Levels are not scientific and are subjectively calculated by the Apogee staff. Does my child need to speak Spanish sign up for CRMC? No – your child’s leaders will be fluent in Spanish and will be able to communicate with the locals on behalf of the group, translating when necessary. That being said, if your son or daughter does speak Spanish and wishes to practice, there are ample opportunities to use their Spanish-language skills throughout the trip. Apogee’s tuition costs are meant to be all-inclusive and include all meal, accommodation, and activity fees. The most significant additional expenses on our Costa Rica Mountains & Coast trip will include travel to and from San Jose, Costa Rica, a sleeping bag, a backpacking pack, and hiking boots. All accommodations on CRMC will be indoors – in hostels and eco-lodges. Sleeping accommodations are fairly rustic, but students should expect to have a bed every night of the trip. The eco-lodge where the group will spend three nights is located in a remote area of the rainforest in a gorgeous setting. There will be filtered drinking water, but, due to its remote location, no hot water. Parents can expect a phone call home about once a week on CRMC, usually corresponding with the group’s rest/transit days. Students on international trips will also call home at some point on arrival day, depending on schedules and arrival times. Should I send my child to Costa Rica with an international phone plan? We encourage families to send their child with a phone for pre- and post-trip communication. However, because Apogee does not permit the use of cell phones by students while on trip, we do not recommend signing up for a Costa Rican phone plan. If you’d like your child to be able to use their phone in Costa Rica on departure day, we recommend you be in touch with your phone provider about any international calling programs they have. We recommend “Travelpass” (Verizon) or “International Day Pass” (AT&T), which charge you a $10 fee per day of use in other countries. To make their weekly call home while on trip, your child will use their leader’s phone to call you over WiFi. We’ll likely recommend parents download a free app, such as Viber or WhatsApp, to facilitate calls home. Look for this information in the spring. In addition to needing a valid passport, we encourage you to coordinate travel with other attendees. To that end, we’re happy to put you in touch with other enrolled families from your region. Please note that Apogee staff members do not travel with students; our trip leaders will already be in Costa Rica on arrival day and will stay in Costa Rica after the trip ends. Apogee staff and trip leaders will have a detailed flight itinerary for each student and will be at the airport to greet them on arrival; our staff will also accompany students to the airport to assist with departures. We will provide enrolled families with a Travel Information document covering details specific to traveling to and from Costa Rica, including airport information and arrival and departure time windows. We know that international travel can be daunting – rest assured that regardless of flight cancellations or delays, we will always have someone on hand to assist with our students’ arrivals and departures. Will my child need to get any special vaccinations before traveling to Costa Rica? Apogee has no vaccination requirements beyond those required in the US. Please note that the US Center for Disease Control recommends most travelers to Costa Rica obtain Hepatitis A and Typhoid vaccines. Families are encouraged to consult with their physician for more information, and to familiarize themselves with the most recent recommendations by the Centers for Disease Control & Prevention and the U.S. State Department. This question is addressed in detail in our Travel Information document for enrolled students. Generally speaking, however, your child will be checking a backpacking pack containing the majority of their gear, while carrying-on their medications and a few other travel essentials. Hiking boots should be worn on the plane in the event of a delayed or lost bag. Is this trip van-supported? How do they get from place to place? Apogee’s leaders do not drive on international trips. Instead, Apogee works with a transportation company in Costa Rica to shuttle the group from place to place. This means that there is no van in which students can leave extra belongings. To that end, please follow the packing list very closely to avoid over-packing. Their backpack should not be full to the brim upon departure, as they’ll need some room in the pack to carry group gear on occasion. Our service projects vary from year to year, but most CRMC groups will work with the eco-lodge at which we stay, doing trail maintenance or helping build and maintain a communal medicine garden. Students can expect 4-6 hours of community service on CRMC and will receive a letter verifying the service at the summer’s end.